Designed, printed and bound by Susan Angebranndt. 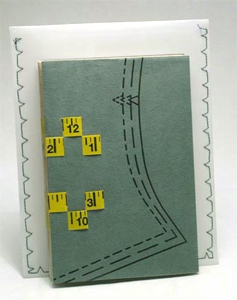 A tender poem by Pulitzer prize winning poet Jorie Graham paired with an inventive binding. Jorie Graham's poem To a Friend Going Blind is about life's boundaries. Most of us think of boundaries as limitations, but they also give life its shape. And what about the gaps—those seemingly useless spaces—that surprise us with a view into profound understanding. Graham uses sewing, fabric and dressmaking to expose the beauty found both in life's limitations and those useless gaps. Read the poem here. To bring Graham's metaphor to life, I've used a measuring tape to bind the book. 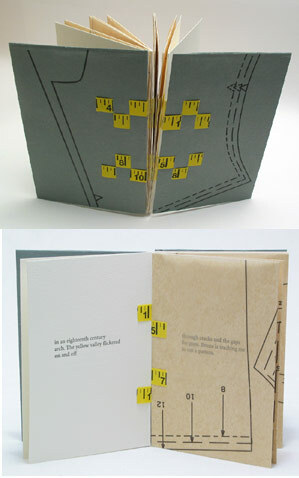 The tape weaves into the pages, creating visual gaps. I've covered some pages with pattern pieces. The pattern paper may seem to obscure the text, but it also asks the reader to look between the lines at those seemingly useless spaces and gaps. The pattern pieces are different in each book. To a Friend... is printed letterpress from photopolymer plates on a hand-feed C&P platen press, using Adobe Minion on Copperplate paper. The binding structure was developed by Elizabeth Steiner. It is an ingeniously simple method of allowing single pages to be combined, with each successive leaf locking the previous leaf in place. The book is housed in a clear Denril vellum pouch and measures 4"x6". An edition of 50.